With the release of & subsequent upheaval surrounding Dawn of Justice, I thought it a good time to revisit the Batman films that recently reminded audiences why we’ve always loved this dark hero. Many Hollywood hunks have worn the mask, to varying degrees of success: Michael Keaton,Val Kilmer, George Clooney. But not until Christian Bale did Batman really become something more than a comic book crime fighter. He and director Christopher Nolan made the character & the film award-worthy, relatable to a broader audience, and something that will last, completely independent of cult status. Bale & Nolan made Batman badass in a way he’s never been on screen before, cool with an edge, and impressive beyond gadgets. This is the origin story of the caped crusader, the world’s greatest detective, Gotham’s dark knight. It starts with Bruce Wayne, a man scarred by a terrible tragedy during his privileged youth and now running from the demons that threaten to tear him apart. He left Gotham and his personal wealth behind, not able to deal with the death of his parents or the growing criminal dominance there. Found by a mysterious man named Ducard who works for Ra’s Al Ghul’s League of Shadows, Bruce trains his mind & body to conquer his fears, to embrace his power, and to submit to a destiny that thrusts him into the spotlight. Bruce becomes Batman, the protector of Gotham City, but a flawed hero who doesn’t understand the balance of law & order yet, who doesn’t know who he can trust. Alfred, his loyal butler, assuredly, and the lovely Rachel, a childhood friend, but who else? No, Bruce will hide behind a mask, stay in the shadows, and work to defeat evil in Gotham one night at a time. 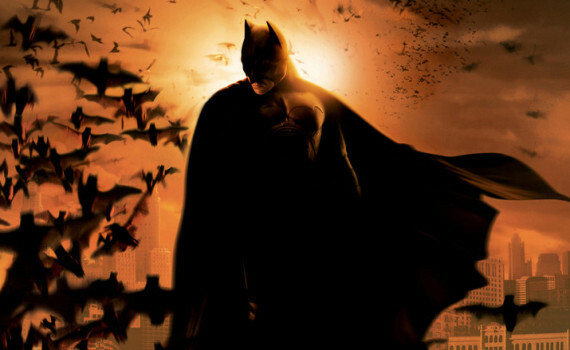 Although far from perfect, Batman Begins is one of the most awesome movies made in the last 20 years. Nolan got it just right, adding in just enough comic book action, nodding to the Tim Burton films of 1990 without copying them, making the plot easy to follow, making the characters simple to love or hate, allowing Batman to grow quickly but imperfectly as well. The result is a cool movie with a classic hero who has been modernized to a very specific & enjoyable degree. Bale plays Bruce like none have before, growling a bit too much as Batman, but passing it off as homage to the melodramatic nature of the basic plot. It’s a masked man fighting Scarecrows and ninjas with his fists and batarangs, after all; we can only be expected to take it so seriously. But that’s the great thing about the first installment of this franchise; it was meant be entertaining but turned out just great enough to also be impressive all on its own. Liam Neeson & Tom Wilkinson as villains, Gary Oldman & Morgan Freeman as friends; with such a stellar cast to support a story we already know and love, Batman Begins was guaranteed to succeed.